The SQL Server 2016 In-Memory OLTP engine (a.k.a. Hekaton) is designed to exploit terabytes of available memory and high numbers of processing cores. It allows us to work with memory-optimized tables and indexes, and natively compiled stored procedures, in addition to the disk-based tables and indexes, and T-SQL stored procedures, that SQL Server has always provided. Hekaton in-memory data is accessible, transparently, using familiar interfaces such as T-SQL and SSMS, but Hekaton’s internal behavior and capabilities are very different than those of the standard relational engine. Everything you knew about how your SQL Server stores and accesses data is different in Hekaton. Everything you understood about how multiple concurrent processes are handled needs to be reconsidered. In this book, Kalen Delaney explains how the new In-Memory OLTP engine works, how it stores and manipulates data, and how, even with all data stored in memory and no locking or latching, it can still guarantee the ACID properties of all transactions. Kalen has been working with SQL Server since 1987, specializing in query performance tuning and SQL Server internals. 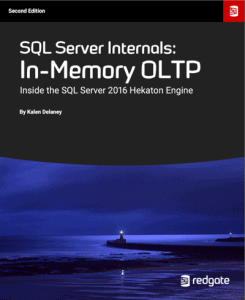 The Hekaton internals knowledge she provides in this book will help you migrate existing tables or databases to Hekaton, and get faster performance from your SQL Server applications than you ever thought possible. Kalen Delaney has been working with SQL Server since 1987, and provides advanced SQL Server training to clients worldwide. She has been a SQL Server MVP since 1993 and has been writing about SQL Server almost as long. Kalen has spoken at dozens of technical conferences, including almost every PASS conference in the US since the organization’s founding in 1999. Kalen is the author or co-author of many books on SQL Server, including SQL Server 2012 Internals, from Microsoft Press. She is one of the main editors for SQL Server Central’s SQL Server Stairways Series. Kalen blogs at www.sqlblog.com and her personal website and schedule can be found at www.SQLServerInternals.com.